China called for calm amid shrill rhetoric from U.S. and North Korea. North Korea's foreign minister said on Monday President Donald Trump had declared war on North Korea and that Pyongyang reserved the right to take countermeasures, including shooting down U.S. bombers even if they are not in its air space. 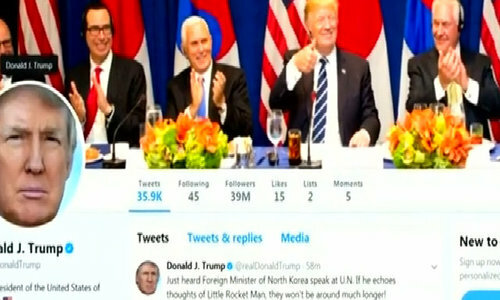 Ri Yong Ho said a Twitter message by Trump on Saturday, in which the president warned that the minister and North Korean leader Kim Jong Un "won't be around much longer" if they acted on their threats, amounted to a declaration of war. White House spokeswoman Sarah Sanders on Monday denied the United States had declared war, calling the suggestion "absurd". "We don't think there's an easy military solution to this problem. There's not a precision strike that solves the problem. There's not a military blockade that can solve the problem," he said, adding that ultimately it would come down to an international effort. Still, McMaster told a conference hosted by the Institute for the Study of War, Washington was concerned a nuclear-armed North Korea capable of hitting the United States was likely to engage in "nuclear blackmail," for instance to try to achieve its goal of getting U.S. troops off the Korean peninsula. South Korean Foreign Minister Kang Kyung-wha said it was vital Seoul and the United States handle the situation "with astuteness and steadfastness ... to prevent a further escalation of tension or any kind of accidental military clashes in the region which can quickly spiral out of control." "There cannot be another outbreak of war on the Korean peninsula; the consequences would be devastating," she told Washington's Center for Strategic and International Studies. Former U.S. Secretary of State Madeleine Albright, the most senior serving U.S. official ever to visit Pyongyang, said it was "important to lower the temperature" of rhetoric. "I'm kind of concerned about accidents of some kind that might happen," she said. "Fiery talk can lead to fatal misunderstandings," U.N. spokesman Stephane Dujarric told reporters. China, North Korea's neighbor and main ally, which has nevertheless backed U.N. sanctions over Pyongyang's nuclear program, called for restraint on all sides. "We want things to calm down. It's getting too dangerous and it's in nobody's interest," China's U.N. Ambassador Liu Jieyi told Reuters. "We certainly hope (the United States and North Korea) will see that there is no other way than negotiations to solve the nuclear issue on the Korean Peninsula ... The alternative is a disaster." China's said it was vital that everyone implement all North Korea-related U.N. resolutions, which call for both tighter sanctions and efforts to resume dialogue. "It is unlikely to take such a risk," said Bruce Bennett of the Rand Corp think tank. "So this sounds like another attempt by North Korea to 'deter by bluster' U.S. actions the regime does not like." Ri warned on Friday North Korea might test a hydrogen bomb over the Pacific Ocean, in what would be North Korea's first atmospheric nuclear test. Experts said such a move, while perhaps not imminent, would be proof of North Korea's ability to successfully deliver a nuclear warhead on a missile.